I woke up late but I’m here! Last night was the wrong night to have insomnia. 2. Three random facts about me? I’m a huge daydreamer; I own a red and white men’s beach cruiser that I’ve named Dorothy, and I’ve donated more than 100 books to my local thrift store and public library this year. 3. How many books do you have in your tbr pile for the next 24 hours? 17 though that number will probably increase. 4. Any goals for the read-a-thon? Nope! 5. If you’re a veteran read-a-thoner, any advice to people doing this for the first time? Have fun and don’t put any pressure on yourself. This is a great event to make new friends at. Can you believe the first hour is almost up? *sigh* Happy reading to all the read-a-thoners! It’s 4.5 hours into the read-a-thon. I’ve finished Anya’s Ghost, ate breakfast (oatmeal with light brown sugar), and took a shower. I’ve also left a ton of comments on readers’ blog, (who knew there are so many bloggers whose names start with M). Now I plan on starting Habibi by Craig Thompson. Thank you to everyone who’s commenting here. I appreciate it! 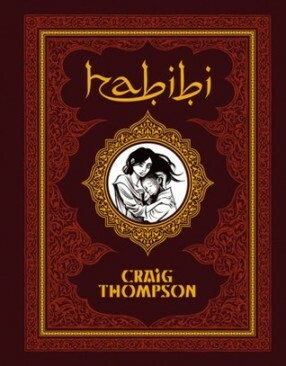 I’ve just finished Habibi by Craig Thompson. I think I like it more than Goodbye, Chunky Rice and Blankets, two of Thompson’s earlier books. It’s an ambitious book that the author has put a lot into. I knew it was a big book but I didn’t bother to check the number of pages. 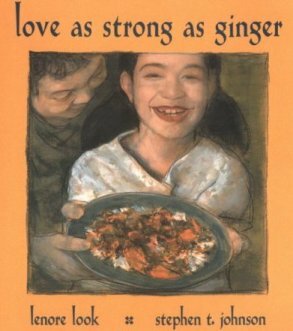 I’ve also read Lenore Look’s Love as Strong as Ginger, which is about the author’s grandmother and the back-breaking work she used to do in a crab factory in San Francisco, CA. It’s a lovely book. So now I’m off for coffee and a quick nap. I know that sounds funny but trust me, it works. If you’re participating in the read-a-thon, how are you doing? 1. What are you reading right now? Interview with the Vampire by Anne Rice. It was an impulse download from the library. 3. What book are you most looking forward to reading in the second half of the read-a-thon? Maybe the short stories. I have a ton of them on my Edison (Kobo e-reader). 4. Did you make special arrangements to free up your whole day? Nope. I just told everyone that today is the read-a-thon. They know what that means – don’t mess up with Momma! 5. Have you had many interruptions? How did you deal with them? I haven’t had many interruptions. I went to the grocery store. That’s it. 6. What surprises you most about the read-a-thon so far? Nothing! It’s a great event. I think one of the things I love so much about this event is that it’s a great opportunity to make friends with bloggers who probably wouldn’t have met otherwise. 7. Any suggestions on how to improve the read-a-thon next year? Maybe we can be more aggressive in getting publishers to donate prizes? 8. What would you do differently, as a reader or cheerleader, if you were to participate again next year? Nothing. 9. Are you tired yet? I was tired earlier but I’m not anymore. 10. Any tips? Relax, don’t put too much pressure on yourself, and short books are always good to have. 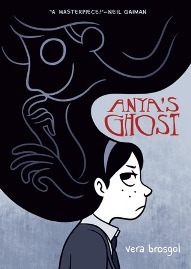 I’ve heard some good things about ANYA’S GHOST. Enjoy! Sorry to hear you didn’t sleep well last night. Enjoy your first book – it looks great! Anya’s Ghost looks like an easy read. Hope you’re enjoying it. Love the cover of your first book!!! Hope you have a really wonderful day today. I’m a huge daydreamer too lol! have a wonderful readathon today! Hope you are enjoying your day of books so far — Happy Reading! I hope you like Anya’s Ghost- I thought it was a really great story. Enjoy the read-a-thon! I’ve always wanted to break into the graphic novel genre and really love it, but I’ve never been able to. SO…I had a good blogger friend say great things about Habibi and I heard raving things about it on a podcast. I decided I would try graphic novels again with this book. HOWEVER, my library doesn’t have it, has a tiny graphic novel section, and doesn’t have ‘plans’ to buy it. So BOO. One day maybe!!! I’ve heard it is incredible. I’ve decided to stop lurking and cheerlead for all my favorite bloggers today. Anya’s Ghost and Habibi both look intriguing. Great picks! I didn’t know there was another Habibi, I read Naomi Shihab Nye’s children’s book of the same title a few years ago and enjoyed it. Woo! Sounds like you’re making progress. Keep it up. 😀 Happy reading. Anya’s Ghost looks great! Yay for finishing your first book of the day! Wow, you’re getting through things well. Hope it’s all going well. I think sleep is why I don’t join. I am not a morning person.. Even if I forced myself out of bed, I wouldn’t really retain information anyway. Hope you’re doing well in the read-a-thon. 17 books in your pile makes it a good selection. Good luck for the rest of the rest of the read-a-thon. I didn’t sleep much last night either, so I feel your pain! I hope you can hang it there! You’ve already finished two books! You can do it! I hope that your reading is going well for you and that you’re having fun! everybody ‘d be so impressed with me!!!! woohoo you are doing a great job! That’s high praise for Thompson’s book: he’s such a consistently strong writer. I’ll be looking out for this one. And such a great pick for read-a-thon-ing, especially if you’re short of sleep. Hope your nap fills the gap. Read on! Wonderful book choices, I want to read all of them. Good luck with the read-a-thon! I hope you’re still going strong! (Or sleeping and enjoying your rest if that’s the case) Habibi looks like an amazing graphic novel – I’m so going to check it out one day! Glad to see you got to read Habibi like you wanted to, and that it was good! I hear you about all the many bloggers whose name starts with M. I feel like I’m swimming anonymously in a sea of them! LOL. Is Habibi a graphic novel also? Is it about his life? I think I’m adding it to my TBR pile! Is the other one by the Lenore Look that wrote the Alvin Ho books? You always come up with such interesting reads! I don’t think you are going to be in the minority. It’s a great book but you’re right when you said that the book has problems. The first part was so choppy and some of the art did seem like Thompson was showing off though I really think he put everything into writing this book. Habibi looks good! I didn’t get any graphic novels for the Readathon this time around. Anya’s Ghost looks so interesting. Congrats on all of the reading done! SIGH. I’m so sad that I didn’t get to do it this year!